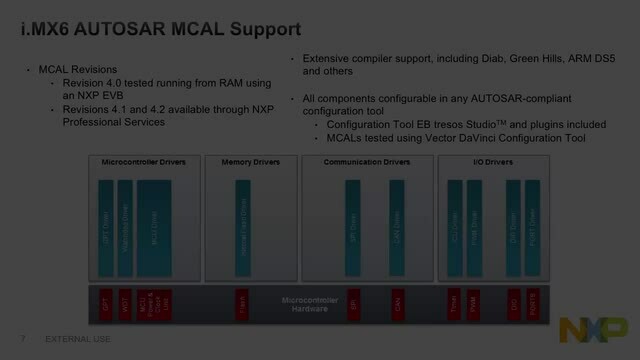 NXP®'s software for AUTOSAR MCAL provides broad driver support for i.MX6-based systems in automotive applications, including the microcontroller, memory, communications, and I/O drivers as well as for the complex drivers for software modules not defined by AUTOSAR. This software is offered through NXP Professional Services. Please complete the contact form for more information. MCU (Microcontroller Unit) driver for basic microcontroller initialization, power down functionality, reset and microcontroller specific functions. WDG (Watchdog) driver for initialization, changing the operation mode and triggering the watchdog. GPT (General Purpose Timer) for the hardware timer channels of the general-purpose timer unit. PORT driver for initializing the whole PORT structure of the microcontroller. DIO driver for reading and writing to/from DIO channels (pins), DIO ports, DIO channel groups. ICU (Input Capture Unit) for demodulation of a PWM signal, counting pulses, measuring of frequency and duty cycle, generating simple interrupts and also wakeup interrupts. PWM (Pulse Width Modulation) for generation of pulses with variable pulse width. CAN driver for CAN transmissions. ENET driver for Ethernet transmissions. SPI handler/driver for reading from and writing to devices connected via SPI busses (e.g. EEPROM, Watchdog, I/O ASICs). FLASH driver for reading, writing and erasing flash memory and handling write / erase protection. FEE driver for the Flash EEPROM Emulation. Additional driver for other standard or non standardized modules are offered through NXP® Professional Services.